Overview - This scathing late-sixties satire from Jean-Luc Godard (Breathless) is one of cinema's great anarchic works. Determined to collect an inheritance from a dying relative, a bourgeois couple travel across the French countryside while civilization crashes and burns around them. 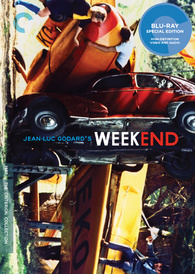 Featuring a justly famous centerpiece sequence in which the camera tracks along a seemingly endless traffic jam, and rich with historical and literary references, Weekend is a surreally funny and disturbing call for revolution, a depiction of society retreating to savagery, and - according to the credits - the end of cinema itself. In the world of art house cinema, there are few directors more divisive among film fans than Jean-Luc Godard. A pioneering member of the French New Wave, Godard's eclectic filmography demonstrates an increasing disinterest in traditional narrative. Instead, the director tends to favor overt formalism, cinematic experimentation, political commentary, and intellectual analysis over story, character, and emotion. This excessively academic approach often leaves many of his films feeling rather cold and tedious. With that said, I'm still a fan of several of his works, including 'Pierrot le fou,' 'Alphaville,' and especially 'Band of Outsiders.' On the other hand, I've always found 'Contempt' to be a bit shallow, and while I greatly acknowledge and respect its important place within the evolution of cinematic style, I've never been too crazy about 'Breathless' either. This brings us to 'Weekend,' a biting and palpably disdainful satire that completely throws cohesive storytelling out the window in favor of a raw, almost mocking exercise in cinematic revolution. Intriguingly analytical, powerfully surreal, darkly comedic, and annoyingly pretentious, the film oscillates between potent experimentation and frustrating banality. In other words, it's quintessential Godard. The plot follows a distasteful bourgeois couple (Mireille Darc & Jean Yanne) as they traverse the French countryside on a voyage to collect a potentially sizeable inheritance from a deceased relative. On the way, they meet several odd characters who all serve as allegories for political, historical, and literary concepts and figures. As the simple trip grows increasingly complicated and dangerous, society starts to crumble around the selfish pair, leading to a darkly satirical descent into violence and savagery. Despite the above plot summary, Godard's goal really isn't storytelling. At least, not in the traditional sense. Instead, the director's focus is on formalistic experimentation, visceral imagery, and scornful satire that all aim to mercilessly criticize upper middle class self-indulgence, complacency and consumerism. The "characters" in the film are really nothing more than empty ciphers and metaphors, and there are no attempts at genuine development or emotion. The film's protagonists are simply scathing indictments of the bourgeois lifestyle, and while they offer no emotional connection, their selfish, nearly inhuman behavior does lead to some effective dark comedy and disturbing observations. Mirroring the satire's contempt for the bourgeois, there is a similar scorn for traditional filmmaking and storytelling conventions throughout the proceedings, and Godard goes out of his way to buck convention in order to dissect cinematic style. This results in several overt techniques that serve to frequently remind the viewer of the inherent artifice of motion pictures. Bold inter-titles are interspersed throughout, interrupting and informing scenes through explicit and alternatively vague associations. One sequence even features the film frame itself getting caught as it reels, blatantly bringing attention to the images' true nature as a movie. Long takes and sustained shots are also common place, with the director often employing extended tracks and pans that call attention to themselves, including the film's infamous nine minute traffic jam scene. Unconventional editing is present as well, and Godard uses repetition in movement and sound to further his themes and ideas. The film's content also skirts into a similar self-aware mode, and there are several instances in which the characters are actually mindful that they are in a movie. Unfortunately, most of this blatant style adds up to very little, and while Godard's analysis of filmmaking, narrative, politics, and society can be stimulating, more often than not the excessively intellectual presentation is rather boring and pretentious. The various odd characters that the film's wretched protagonists encounter are nothing more than empty symbols, and while they spit out numerous high-brow references, very little of what they have to say is terribly interesting. Sure, there is some minor amusement to be had from the film's random encounters with the likes of Emily Bronte, Tom Thumb, and a singing Jean-Pierre Leaud, but other excursions just feel pointless and self-indulgent. With that in mind, the film's first and third acts prove to be its most troublesome. The movie's final segments shift the focus to a cannibalistic group of terrorists, and none of this material really clicks on any deeper levels -- and perhaps even more distressing, it's all quite tedious to watch. At its worst, the film just dresses up self-important philosophical nonsense through trying style and overbearing satire. Don't get me wrong, there is still interesting substance here, but none of it is as revolutionary as Godard's presentation seems to imply. While I was unimpressed with several aspects of 'Weekend,' there is no denying that the film is home to a few memorable and truly powerful sequences. In fact, the middle portion of the movie -- which focuses on the characters' surreal road trip through France -- is actually very affecting and absorbing. Godard creates an apocalyptic sense of dread, decay, and destruction through his increasingly dire images and absurd scenarios. Burning cars litter the streets and roads, creating a stark portrait of a society on its last legs. One scene features a violent squabble between two people after a car accident, and the director starkly cuts to close-ups of various witnesses, their expressions oscillating between callous indifference and disturbing amusement (perhaps standing in for the audience). These visceral, nightmarish sequences work much better than the film's tiresome excursions into academic self-indulgence. "The thing I'll say about Jean-Luc's films is that some of them are really annoying. Some are really quite boring. But compared to other director's who make boring films for an hour and a half, with Jean-Luc there's always at least twenty minutes which are fantastic." Suffice to say, big fans of the director will likely find a lot to admire here. Detractors, however, will likely only have their qualms further reinforced. Criterion presents 'Weekend' in their standard clear case with spine number 635. The BD-50 Region A disc comes packaged with a booklet featuring an essay by critic Gary Indiana, excerpts from Alain Bergala's book "Godard au travail: Les annees 60," and an excerpt from a 1969 interview with the director. The film is provided with a 1080p/AVC MPEG-4 transfer in the 1.66:1 aspect ratio. Though numerous aspects of the video are quite strong, there are a few drawbacks here and there. The print is in good shape with only a few minor specks. A moderate to heavy layer of grain is present throughout, giving the picture some rough but authentic texture. Unfortunately, an odd visual anomaly seemingly inherent to the source does crop up from time to time that can be a little bothersome. In a few scenes during panning or tracking motions (including the entire duration of the film's infamous traffic jam sequence) the image along the very right end of the frame appears to smudge and slightly stretch out. It's rather subtle and only happens in isolated instances, but some viewers might find it distracting. Clarity in close-ups is very strong, revealing a pleasing sense of fine detail, but wide shots (which make up the majority of the movie) are on the soft side. Colors are nicely saturated but not exactly vivid, and many scenes have a predominantly flat quality. While black levels can be just a hair elevated, overall contrast is well balanced. 'Weekend' comes to Blu-ray with a solid and authentic transfer that preserves Godard's bold aesthetic. The grainy, occasionally soft image isn't always impressive, but outside of some minor distortion in certain shots, the presentation is faithful and effective. The audio is presented in a French LPCM mono track with optional English subtitles. Basic yet serviceable, this is a decent albeit uneventful mix. Dialogue is clear but the sound has a fairly tiny and boxy quality. Effects work is solid (all of those annoying honks come through well) and the single channel of audio does what it can. Dynamic range is on the flat side, however, and music does strain a bit in the high frequencies. There are also instances where the score starts to drown out speech just a bit -- though since this is Godard, that might actually be intentional. Thankfully, I did not detect any major hissing, pops, or crackle. The mix suffers from some slight balance issues and an age-related thinness, but it gets the job done. Godard does a few interesting things with sound throughout the runtime, and while these audio choices can actually be quite annoying, they are respectfully presented. Criterion has put together a fairly slim but still very welcome collection of supplements, including a video essay and a few interesting interviews with members of the crew. The extras are presented in 1080p with Dolby Digital 1.0 audio and English subtitles for the French portions only (unless noted otherwise). Revolutions Per Second (HD, 25 min) - In this visual essay, writer and filmmaker Kent Jones provides an analysis of the film's content and historical context. Jones shares some quotes by Godard and details the director's involvement in the May 1968 protests in France. Jones also discusses the movie's symbolism, allegories, literary references, and visual style. Interviews (HD) - Interviews with cinematographer Raoul Coutard (19 min), actors Mireille Darc & Jean Yanne (3 min), and assistant director Claude Miller (25 min) are presented in 1080i, 1080p, and 1080i respectively. The participants offer details about the shoot and their working relationship with Godard, painting the man as a fascinating but often times solemn and occasionally unpleasant director. On Location (HD, 8 min) - This is an excerpt from a French documentary program that provides some worthwhile footage of the director in action. Filmmaker Jean-Michel Barjol also shares some insights into Godard. In a seemingly rare instance of happiness on-set, there's even a very quick shot of Godard smiling after a take. Trailers (HD) - The film's French and U.S. trailers are provided. 'Weekend' is a darkly surreal, and absolutely contemptuous satire on the pitfalls of bourgeois indulgence and consumerism. While Godard's experimental approach and apocalyptic imagery can be interesting, the majority of the presentation is more pretentious than enlightening. The video transfer is solid and while unimpressive the audio is faithful. The included interviews, behind-the-scenes featurette, and video essay all provide some interesting insights into the director's style and intentions. Big Godard fans should not hesitate to pick this up, but detractors will want to stay clear, and those new to the director are better off checking out one of his earlier films first.